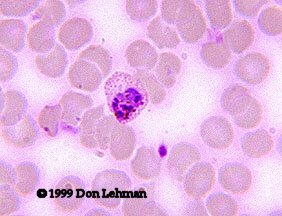 Plasmodium ovale prefers to infect immature RBCs, which limits the parasitemia. 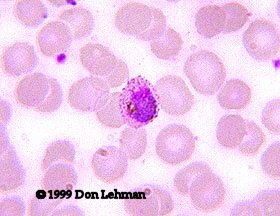 Infected cells are oval and slightly larger than uninfectd cells, and malarial pigment called Shuffner's dots is usually present. 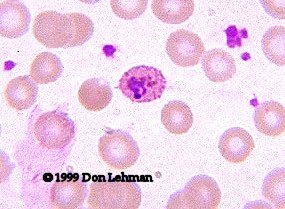 The trophozoites (at right) often are very amoeboid. Mature shizonts have between 8-12 merozoites. The shizont at left is immature and has about 6 merozoites. The gametes (below) are round to oval with light diffuse brown pigment.